Book your place now for the Chalvet Open : 21-27 August 2011, St Andre les Alpes - see you there! 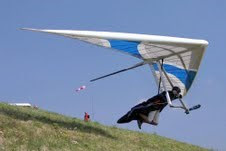 Just checked the PILOT LIST and it's looking like it's going to be one of the biggest hang gliding comps this year with around 90 entries..... Phil our scorer tells me he's booked his week in rehab! The comp includes the French and British Nationals. As well as Class 1 there will also be a comp for Club [Sport] Class and Rigid Class 5. Talk at The Worlds was that the Rigid Pilots are hoping to do 200+km flights (weather allowing) but aren't we all. We apparently have the whole launch area 'booked' and the whole mountain to ourselves (ie no PG) during the taskable time.